For the first time in a century, a bowler-outfield player hat-trick was completed in the County match yesterday. Craig Overton and Marcus Trescothick made an entry into the history books through this unique achievement which last happened in 1914. Representing Somerset, Crag Overton got three consecutive wickets against Nottinghamshire with Marcus Trescothick being the fielder to complete all the three catches. The three victims were Ben Slater, Samit Patel, and Riki Wessels. They were trying to save the match after conceding huge first innings lead to Somerset. 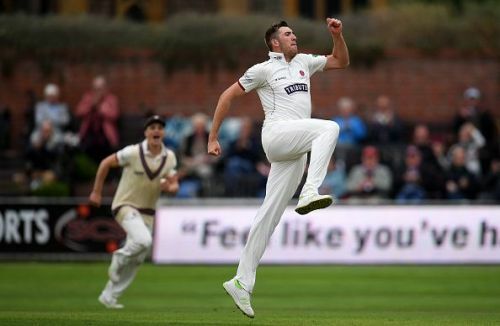 Craig Overton, who was bowling in the 41st over of the innings got the edge of the bat of Ben Slater who was then batting one run short of a half-century. Marcus Trescothick, fielding at the second slip took the catch with ease. The next two batsmen were also out in the similar fashion. Eventually, Nottinghamshire was all out for a paltry 184 and lost the match. It was also the second hat-trick for Somerset in the game. Tom Abell, the Somerset skipper had completed a hat-trick against Nottinghamshire in the first innings. The last time such an event occurred was also in England in 1914. George Thompson of Northamptonshire was the player in that case. Craig Overton ended the innings with a three-wicket haul. His hat-trick wickets were the only wickets he took in the in. With this achievement, Overton will be looking to impress the England selectors with more consistent performances in the future games. On the other hand, Marcus Trescothick signed a one-year contract extension with the Somerset Cricket team a few days ago. At 42 years, he has been the most successful batsman for Somerset, having amassed over 7000 runs in his 27th season. Having safe hands to take slip catches at this stage of the career is highly commendable and inspiring.